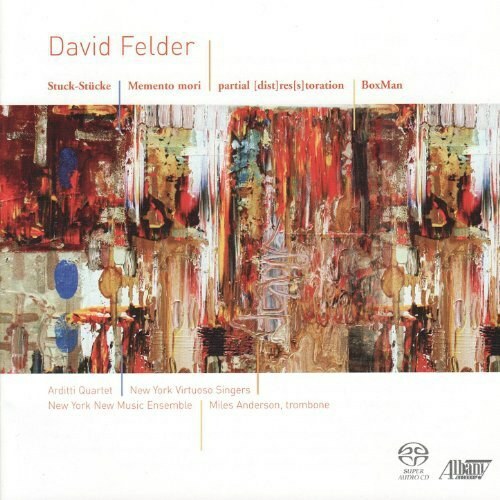 The music of the American composer David Felder projects itself to the future with deep roots in the tradition in a spiral of sounds which surround the listener. You can perceive this while listening to BoxMan, the new disc of the artist (Distinguished Professor at the State University of New York at Buffalo and Artistic Director of the Festival June in Buffalo). In this collection, published by the prestigious Albany Records, we find some of his most significant compositions, composed in the last twenty years. Starting from Stuck-stücke, a hypnotic string quartet in 15 short movements and superbly performed by the prestigious Arditti Quartet, a reference work for the modern and contemporary repertoire; an ensemble comprised of Irvine Arditti (violin), Ashot Sarkissjan (violin), Ralf Ehlers (viola) and Lucas Fels (cello). These four musicians are comfortable with a music which, while re-reading the past, materializes the contradictions of the contemporary. The essential and simple theme cells of the composition (as it happens in commercials) become a pretext from which the tensions of the complex inner world of Felder materialize themselves. Even more evocative is Memento Mori, that Felder entrusted to the New York Virtuoso Singers, conducted by Harold Rosenbaum. We arrive at BoxMan, the final track of the album. Composed in a two-year period 1987/1988 and revisited with new injections of electronics in 1999, the composition is performed by trombonist Miles Anderson who succeeds in expressing Felder's feelings. Albany Records also recently released the DVD Shamayim, whose accomplishment is based on a faithful realization of the musical intention of the composer, specifically in the distribution in the acoustical space of the musical elements (surround 5.1).